I got this book for free in exchange for an honest review. I got this book from T Squared Books. First of all l would like to say a big thank you to M.J Trow for sending me this book and giving me a chance to read it. I would also like to say a big thank you to T Squared Books for letting me be apart of their book reviewing team. I normally read books of this genre but l also stepped outside my comfort zone I am so glad l did because l have read so many great books and come across some great authors. Book Dedication: to Mam, with thanks for her reminiscenes of the war ( and for teaching me to write!). This book has 220 and 12 chapters. Acknowledgements: my thanks to all who have contributed to this book. To those who lived in the thursley area in 1942. - ex – pc a W. Bundy, Miss P.J Dummer, Mr A.E Gale. To those who knew Joan Wolfe. - Mrs R. Durrant, Mrs Betty Holliday and others. To 'the Canadians'. - Carl Goodard, Carol White of the personnel records centre, national archives of Canada and Mrs Helen McKay of the battleford branch library. To Linda Findlay of the surrey police headquarters press office. To Michael Page of the archivist's department, surrey country council. To Joan Charman, librarian of the goldalming trust. To G.R Cpllyer, editor of the surrey advertiser. To all authors and publishers from whose works l have quoted. To my wife, Carol, for all her hours of labour ate the keyboard and her continued help and support. 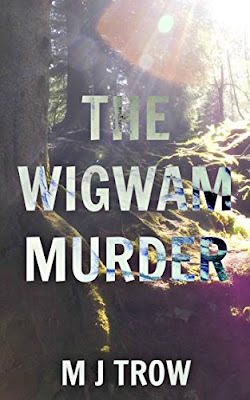 Synopsis: The wigwam murder – as the case against August Sangret came to be known – was one of most brilliant pieces of detection and forensic science then on record Drs Keith Simpsons, Eric Gardner and Gerald Roche Lynch worked together to present a comprehensive body of work that convinced and shocked the jury. It was the first time that a human skull had been produced in a British court room. It belonged to Joan Pearl Wolfe, a nineteen-year-old runaway and vagrant who hung around Canadian army camps, particularly in the hankley common, Surrey, area. The man who went to the gallows in April 1943 for the capital crime of murder was August Sangret, a french – Canada metis Indian despite the amazing forensic work, the evidence against him was purely circumstantial 'no, sir, I never killed that girl, somebody did it and I guess I will have to take the rap,' he said. In this compassionate re – telling of the short and tragic relationship between the two young misfits, M.J Trow builds on his reputation as a chronicler of human failings and bringer of the light of day in to the cold pragmantism of the courtroom with a foreword and afterword to give the 21st century reader some additional insight in to both the time of the murder and the time of the original research of twenty years ago, this book is a gripping and at times heartrending tale of two lost people in a world torn by war. Review: I found this book really easy to get in to and hard to put down once l started reading it. I was hooked on this book after reading the first page. I can not put in to words how great this book is l would tell people to read it for themselves to know how great this book really is. This book is really a great read and it did not take me long to finish this book. I reviewed this book on goodreads, amazon UK and US and on my blog. I got this book in paperback but it is available in kindle edition. I was sad to read about Joan Pearl Wolfe murder I hope the police catch who murdered her I would love to read more from this storyline and more from the author I wish this book would not finish. This book is truly gripping it will leave you wanting more. I hate how a person can take a life of another person. I am glad this book is on my bookshelf. I was really sad to finish this book. I was sad that Joan did not get to turn 20 years old and her baby never got a chance to live outside the womb. Joan sounded like a sweet girl. I wish she had got to go home to see her family again. I feel for Joan's mother no mother should have to bury their children I wish Joan's mother had got to see her daughter become a mother and she got to see her grandchild. I was sad to read that Joan's father gassed himself I wish they knew why he committed suicide I think Joan would have been different if her father was still alive to help. Her mother tried everything to get her beloved daughter to come home but nothing made Joan want to come home which l thought Joan would want to be around her family at the time so she would not be alone while she was pregnant. When I was reading this book I would put some essential oils in my humidifier and put the lights on my humidifier and chill on my bed and listen to magic or something on spotify or something on TV or netflix l also put on my christmas lights on that are on my christmas tree. I sometimes light a candle when l was reading this book. I really enjoyed reading this book. I could not get enough of this book. I do not understand if August did not murder Joan why would he take the blame like August Sangret did if was me l would not take the blame for something l never did. I was wondering if Joan's skull was buried with the rest of her body after reading that it was shown in court l hope it was and she has a nice spot in the graveyard where her family can go and remember their beloved family and her unborn baby and put flowers on the grave. I was sad that Joan's life was cut short and in a violent way and it was upsetting that she was not discovered for a few weeks and that maggots and rats had been eating away at her so they could not tell if she was pregnant because her womb had been eaten. I loved this book I would happily read this book again because l really enjoyed it. Sometimes it is good just to chill reading a good book when you are not well or in pain like l am with arthritis. I also took a picture of this book to share it to my Instagram that l made just for pictures of my books it is called donnareviewsbooks. Afterword: Since the writing of the Wigwam murder, the world has turned, but nothing new has emerged in this particular case. The aftermath of let him have it, Chris was astonishing not only was the murder conviction against Derek Bentley overturned, but the laws that made it possible, that of joint felonious enterprise, has been repealed the Bentley decision, the hanging of an educationally subnormal boy for a murder he did not commit, was controversial from day one. The Wigwam case was not there was a war on, newsprint itself was in scarce supply and the jury was sufficiently swayed by the evidence to find August Sangret guilty. Despite their recommendation to mercy, no mercy was extended to the outsider, the loner without any real friends in the book you have just read, I find the evidence against Sangret circumstantial and the verdict unsafe, but l concede I may be in a minority of one. Thames television, as they then were, contacted soon after publication. The story of an Indian living in a Wigwam in rural surrey intrigued them (though I suspect they may have had their wires crossed with grey owl, Archibald belaney, 1888 – 1938) and l 're-enacted' the murder on location, swinging a birch branch towards the camera lens and scrabbling through the undergrowth since this was a local news 'feature', there was no fee and l am not even sure if it was ever shown very belatedly, l was contacted by a member of the Sangret family who expected payment because l had 'used' his forebear in a book l decided not to reply to tell him that. That was not how publishing worked! Years later still, I was asked by the historical society at Scotland yard to talk to them on the case. The evening was well attended, I showed my power. Point presentation and l hope a good time was had by all. The famous 'black museum' which I have now visited twice, thanks to the metropolitan police's good offices, could not help with the Sangret case because it came under the jurisdiction of the surrey police at the time the most bizarre follow up to the Wigwam murder was a letter out of the blue from a man who claimed to be August Sangret's son, he could not understand how l could have got my facts so wrong because his mother had told him that Sangret was his father and he had not been born until 1950. since this was some seven years after the metis execution, I could not understand that either welcome to the world of true crime! About The Author: M.J Trow (the 'M' as most people know stands for Meirion, a welsh name few can manage, so he writes as M.J, is known by all and sundry as Mei, rhyming with 'My') has been writing for many years, with his first book – the adventures of inspector Lestrade – being published in 1984 by Macmillan. More Lestrades followed and then some true crime and somehow it all snowballed so now he has many historical biographies and three other crime series (Maxwell, Marlowe and Grand and Batchelor, the latter two written with his wife, writing as Maryanne Coleman, though her name is Carol, actually!) to his credit. He claims to be retired, but that is just from teaching. In fact he has never been busier and is sought after 'ghost' these days as well as historian and novelist, with many different subjects' stories having been told through him. He has recently started collaborating on fiction projects ( with someone other than his wife, that is) and finds it a really exciting and pleasurable experience. To relax he... actually, that's a bit tricky, as he does not really ever relax. He has been know to garden, he is a keen cook and artist and likes to travel. This is rather easier these days as he is a popular speaker on cruise ships – in fact his profile picture was taken on a very gusty day in cape town, setting off on a long voyage home to southampton through some of the scariest seas he and his wife have had the pleasure to meet! It really was the calm before the storm, despite being a force 9 just leaving the bay. Family is important and he is very proud of his wife, Carol ( aka Maryanne Coleman) for her own books and also the ones they write together, the Kit Marlowe series. His son, Taliesin, know as Tali, is a writer who has written a biography of the tudor explorer Martin Frobisher as well as collaborating with Mei on several biographies. An exciting series is in the melting pot at the moment and will hopefully be appearing soon; remember where you heard it first. Tali is also a musician, playing various instruments with some acclaimed bands; Gemma Hayes, the coal porters, circulus and currently acid-folk ensemble the lords of thyme. He also records and tour-manages. His crystal vocals enhance everything he does and it is just as well someone in the family can sing, as it is the first thing anyone asks a welshman!. About The Book: I really like the bookcover and the colours used on the cover are really nice they are not too bright and not too dark. I really like that some of the writing is in grey and some is in white as it makes it stand out more.